Following several misleading news reports that claimed 7 percent of an identical twin's DNA changed after he spent one year in space, rendering them no longer identical, NASA reissued the press release clarifying the preliminary findings of their "Twins Study." 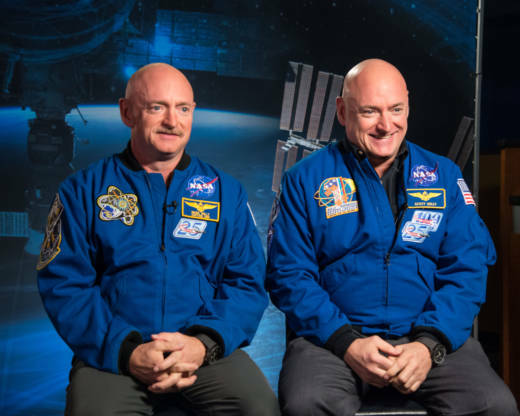 "Mark and Scott Kelly are still identical twins; Scott’s DNA did not fundamentally change," the updated press release says. Scott and his twin brother, Mark Kelly, were the subjects of the study, which looked at how spaceflight affects the human body. Scott lived on the International Space Station from March 2015 to March 2016. Researchers documented physiological and psychological changes in Scott and compared the data to his twin brother Mark, who remained on Earth and served as a control subject. In reality, if a whopping 7 percent of Scott's DNA had really changed, he likely would no longer be human. Researchers now know that 93% of Scott’s genes returned to normal after landing. However, the remaining 7% point to possible longer term changes in genes related to his immune system, DNA repair, bone formation networks, hypoxia, and hypercapnia. In reality if 7 percent of Scott's DNA had changed, he likely would no longer be human. As National Geographic's Nadia Drake noted, "humans and chimps have genetic sequences that differ by less than 2 percent, and individual humans—even completely unrelated strangers—differ by about 0.1 percent." So what exactly did NASA researchers discover? The changes in Scott's genome were related to gene expression, not the actual structure of his DNA. The updated press release is careful to note that the observed changes were "very minimal." "What researchers did observe are changes in gene expression, which is how your body reacts to your environment," the press release says. "This likely is within the range for humans under stress, such as mountain climbing or SCUBA diving." Meaning that the observed changes are not all that surprising and can happen to anyone who engages in some sort of strenuous activity. Changes in genetic expression reflect whether genes are activated or deactivated, which in turn determines how cells develop and function. "Within each of us, most of our cells are otherwise genetically identical, but their genes are expressed at different levels," writes Drake. "It’s those patterns of expression that produce hearts, brains, eyeballs, and other things, kind of like using the same set of ingredients to cook up vastly different dishes." The confusing news reports overshadowed some important findings of the multifaceted study, which also looked at how the spaceflight environment impacts cognitive performance and the immune system. Researchers noted a pronounced decrease in cognitive speed and accuracy after Scott landed, possibly related to re-adapting to Earth’s gravity. The preliminary study noted however that most of the biological changes observed in Scott quickly returned to normal after he returned to Earth. NASA says it plans on releasing more comprehensive results of its study later this year.